The Great War gave women new opportunities to take their place within the workforce. Many sought work out of need but others simply seized an opportunity previously closed to them. The portrait painter Flora Lion was given access to paint factory scenes in Leeds and Bradford during World War One. She visited the Phoenix Works at Thornbury where women were employed in heavy industrial manufacturing. Agnes Scatterty, Commandant of Spencer Street Hospital, Keighley on being awarded the MBE, June 1918. Photo supplied by Andy Wade, Men of Worth. Annie Walker of Eccleshill was a mother of five and a diabetic. 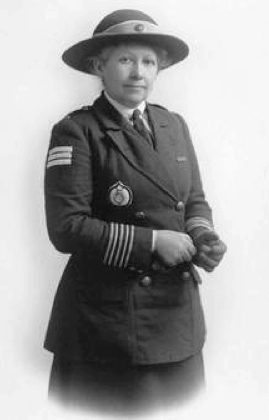 She delivered post during the war and was to die at the early age of 50 in 1924. Women conductors were strongly opposed initially as not strong enough to manage the brakes on Bradford trams. In every area of national life women donned uniform – to be bus conductresses, deliver post or serve as one of the 258,300 women working outdoors in the Land Army. By the end of war over 900,000 women were also working in munitions factories exposed to every kind of danger and risking their lives and health on behalf of the war effort. 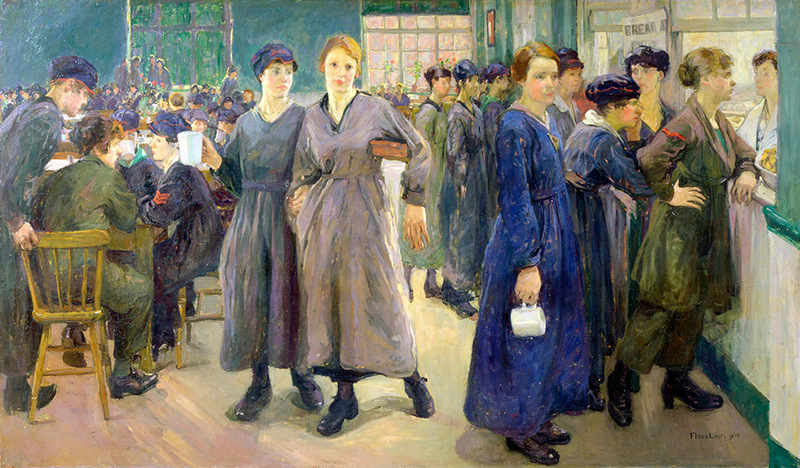 The pre-war-trained nurses of the Queen Alexandra’s Imperial Nursing Service (QAIMNS) served from the outset in many theatres of war including France, Belgium, Greece, and Iraq. By the end of the war 10,400 had served with QAIMNS. 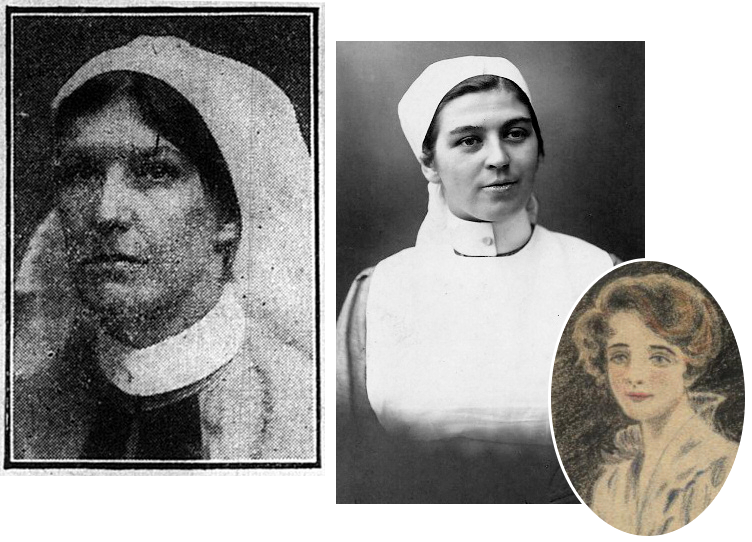 Their work in military hospitals and dressing stations near the frontlines resulted in some of them becoming casualties themselves and one hundred and forty one nurses are known to have died. Women’s work was often physically exhausting. 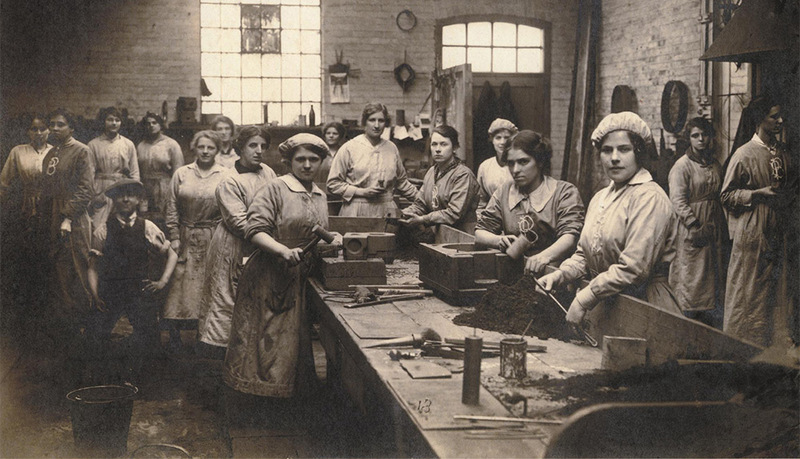 In munitions factories, such as the Low Moor works, there was constant danger from explosion and the women’s health often suffered from contamination by explosive materials. 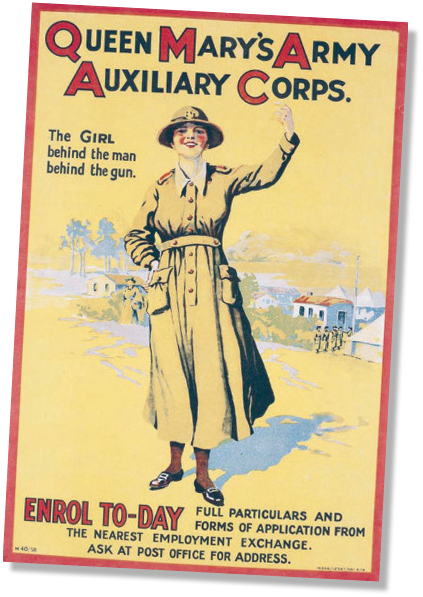 Women joining the Voluntary Aid Detachment (VADs) were trained by the Red Cross and worked as nurses in the United Kingdom from the outbreak of the war. After April 1915, as casualties increased and the need for more hospitals grew, VADs also worked in military hospitals on the Western Front. Like members of QAIMNS some lost their lives and none were free from the dangers of disease or, when abroad, from enemy attack. Hester Agnes Onions was born in Bradford in 1880. She was awarded the Royal Red Cross decoration for outstanding service throughout the war at Casualty Clearing Stations and hospitals in France. Image supplied by Mike and Tish Lawson, Baildon Local History Group. A wounded soldier produced this sketch of Shipley VAD Minnie Edmondson who nursed at Birmingham War Hospital and 21st General Hospital. Minnie married another patient, Henry Owen Trehearne, and emigrated to South Africa. Her grandchildren have supplied these images. After the extremely heavy losses on the Somme in the summer of 1916, many men in military administrative posts were transferred to combat roles. Their places were taken by members of Queen Mary’s Auxiliary Army Corps. 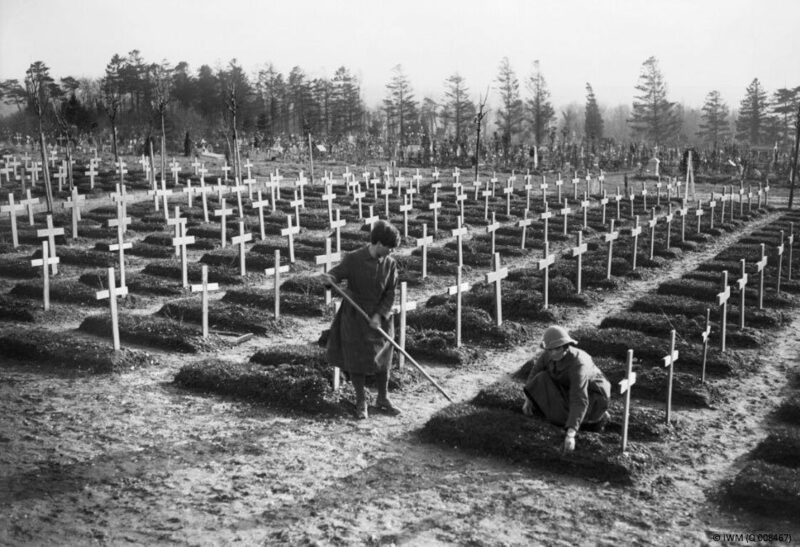 By the end of the war 10,000 officers and 52,000 of other ranks had worked in the QMAAC undertaking every type of office and domestic employment, working in bakeries, ordnance, motor transport depots and as gardeners in military cemeteries. In France air raids were a constant threat late in the war resulting in loss of life. In one raid alone in May 1918 seven women were killed. 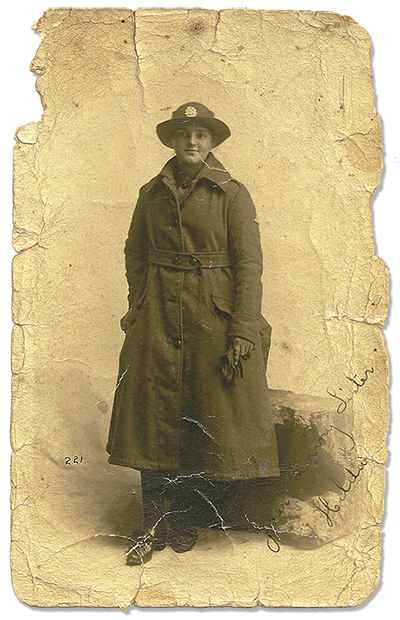 Frances Hildred Mitchell of Keighley died whilst serving with QMAAC at Brocton PoW Camp. She is buried at Utley Cemetery. Her niece, Barbara Barker, supplied the photograph. Harriet Lightfoot who was born in Bingley in 1891 is amongst these members of Queen Mary’s Army Auxiliary Corps (QMAAC). They are marching from No. 2 Stationary Hospital in the funeral procession of the seven women who were killed in the enemy air raid at Abbeville on 31 May 1918.